A Briton living overseas was among the 5,000 killed in the Nepal earthquake, the UK Foreign Office has confirmed. Foreign Secretary Philip Hammond has not named the victim, who had dual nationality, but said they had been living in Hong Kong. The government is also "urgently investigating" reports a further British national had been killed at the Everest base camp, he added. Meanwhile, a UK appeal for disaster victims has raised more than £19m. The appeal total includes £14m in public donations and £5m from the UK government - which matched the first £5m of public donations. The UK has also pledged £15m to Nepal in aid. The victim is the first confirmed British death following Saturday's 7.8-magnitude earthquake, but about 30 British or Irish families are still waiting to hear from relatives. Eight million people have been affected by the disaster, according to the UN. 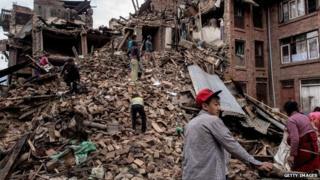 Meanwhile, Nepal's prime minister Sushil Koirala said the death toll could eventually double, to more than 10,000. Speaking after chairing a meeting of the government's emergency Cobra committee, Mr Hammond said about 120 British nationals were being flown home from Nepal. In a tweet he said the flight - which is expected to land at Stansted Airport in the early hours of Thursday morning - had left Nepal. More UK nationals would be brought home in the next few days on returning UK military flights from Kathmandu, the capital of Nepal, Mr Hammond said. UK teams in the country were working "around the clock" in Nepal to look for British people, he added. An RAF Hercules aircraft carrying additional kit had now landed in the Middle East and will fly to Kathmandu "at the earliest possible opportunity", an RAF spokesman said. The RAF is also preparing to send Chinook helicopters to Nepal "as soon as we can agree the necessary arrangements", the spokesman said. Mr Hammond previously estimated there had been 500 to 1,000 British nationals in Nepal, but warned there was "no single co-ordinated list". Susannah Ross, 20, from Bath, is among a group of trekkers stranded in the Langtang valley, in northern Nepal. Her sister, Nina Ross, said her family had received a satellite message at about 05:00 BST on Wednesday saying the group was still waiting to be rescued. She said her sister was not expected to be rescued until Thursday at the earliest. "We're really hoping to get through to different embassies to hurry it up because there's still falling rocks in that area that are killing people," she said. US medical student Dr Marisa Eve Girawong, who was studying at the University of Leicester, was among those killed in avalanches on Everest. More than £19m has been donated to the Disasters Emergency Committee (DEC) Earthquake Appeal, one day after it was launched with a TV appeal presented by actress Joanna Lumley. The DEC, an umbrella organisation that brings together 13 British aid charities to deal with international crises, also launched a website and donation line. The Queen and Prince of Wales have made separate undisclosed personal donations to the appeal and sent messages of support to Nepal. A team of more than 60 international search and rescue responders and specialist rescue dogs from the UK have now arrived in Nepal. Some members of the team are already operating on the ground and travelling to more remote areas of the country, the Department for International Development said. They are drawn from 15 fire and rescue services from across the UK and have expertise in finding deeply-buried victims, constructing timber supports to shore up buildings and providing advanced life support. They have been joined by an eight-strong group of expert trauma medics, while more British medical crews are expected to arrive in the country in the coming days. Rob Holden, head of the UK emergency medical team said he had heard reports of "thousands of survivors with trauma injuries who urgently need surgery". "Doctors have been forced to operate around the clock and often in makeshift hospitals made of tents," he added.